"When you desire a single source for fabrication and assembly." 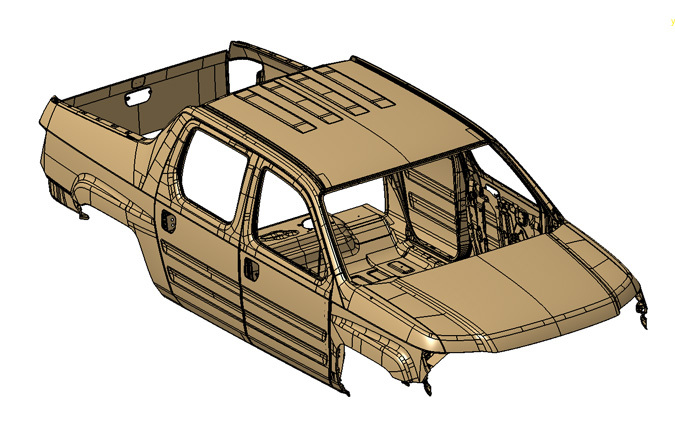 Objective: Prototype production and assembly of mild steel SUV body panels, including hood, door panels, quarter panels and roof panel. The stamping dies for the panels were designed and casted in-house utilizing our on-site foundry and profiled on our NC machines (prototype stamping dies at Hidaka USA, Inc. are made with kirksite, a zinc based alloy). The final assembly was performed on a weld fixture developed in-house utilizing our manual hanging SPOT welders. Our ability to accomodate prototype, limited-run custom orders and mass production demands is a result of our unique equipment lineup and technical expertise. Our process engineering team will develop the optimal process for your parts, whether it is through manual processes best fitted for prototype builds, or through a mass production setup.